The sages of ancient India developed the astrological practice of Jyotisha as a karma-measuring apparatus to indicate where your karmas will permit ideals to be shared between you and those with whom you relate. Jyotisha can help restructure relationship dynamics by providing perspectives on when and how your relationships and their difficulties are likely to arise and dissipate. 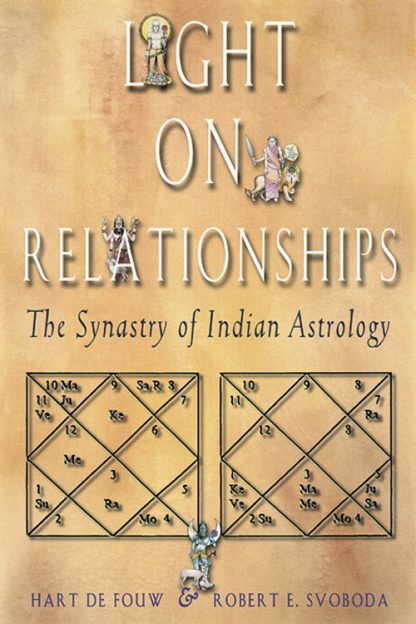 Light on Relationships is currently the only book that makes relationship analysis accessible to the modern student of Indian astrology. If you want to learn how to use this system for chart comparison, this book gives you the complete details. The authors cover the techniques of synastry and explore all the facets of what makes a relationship work--or not--including personal karma and goals, family influences, the Ayurvedic constitution or dosha of each individual, and how these elements are revealed. In an entertaining and informative way, the authors explain how the individual chart will reveal your inborn ability to relate. They explain the traditional ten Porutthams, which evaluate a couple's sukha (external and internal happiness), and explore superstitious concepts, such as Vishna Kanya (literally, "poison maiden"), or Kuja Dosha ("The Blemish of Mars"). Included are details on determining the most auspicious times for a wedding. This approach to synastry has been developed over years of experimentation. The authors blend the principles of synastry with other techniques culled from Jyotisha's classical canon. Some of the less conventional techniques presented come from ancient oral traditions never before incorporated into the classical works. Other methods come from the authors' mentors; and some have been developed from processes validated over many years of their experience. The authors build on some of the best principles of the astrological traditions of both West and East, hoping to bring the two camps closer together. U. Hart de Fouw and Robert E. Svoboda are authors of Light on Life: An Introduction to the Astrology of India. Both are seasoned astrologers. Svoboda lives in Texas, deFouw lives in Toronto. They both lecture internationally.